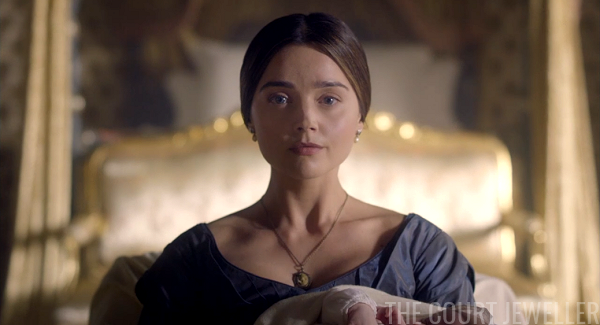 The episode opens in early 1841, with Victoria holding her newborn daughter, Princess Vicky, and wearing pearl earrings with a delicate pendant necklace. Vicky is quickly whisked away by a nurse, while Victoria is taken out in a pushchair with Dash in Vicky's place on her lap. 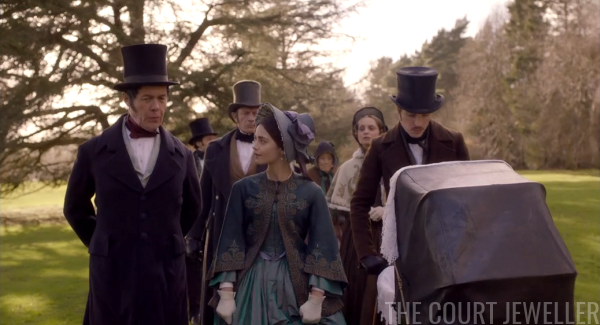 The Duchess of Kent, Baroness Lehzen, Harriet Sutherland, and Emma Portman accompany her. 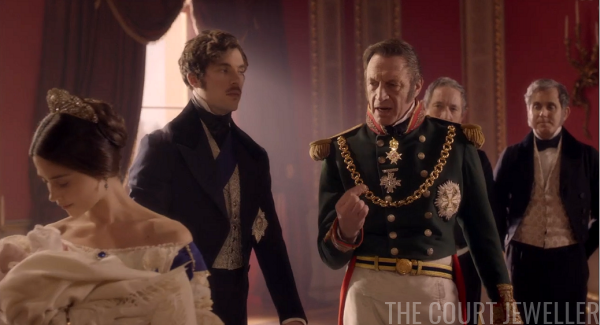 Albert's reminded of his place when Victoria abandons the pushchair and interrupts the meeting, doctor's orders be damned. 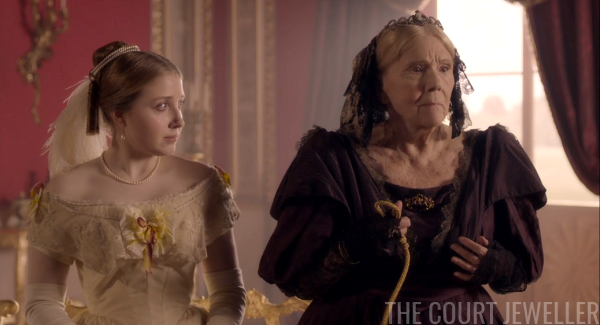 The Duchess of Kent, who has apparently sworn off daytime tiaras this season in favor of doilies and brooches, is very unhappy with her daughter. 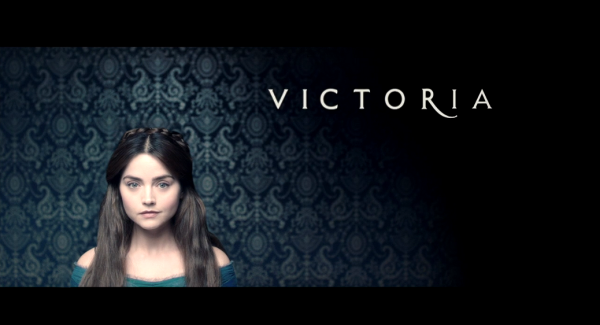 Victoria doesn't care. Victoria is ready to go outside and rejoin the world. But not so fast: Sir Robert Peel (who became PM in August 1841) and his private secretary, Drummond, slow her roll by reminding her that she's not yet been churched, so she can't go out in public. ...and then heads for the stables to finally get to go riding again for the first time in months. She's also keen to rekindle other parts of their relationship, but the canoodling that results is interrupted by Vicky and her nurse. 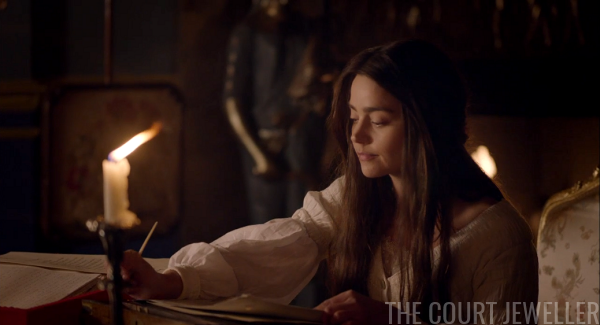 Meanwhile, Victoria is relieved to get back to work. 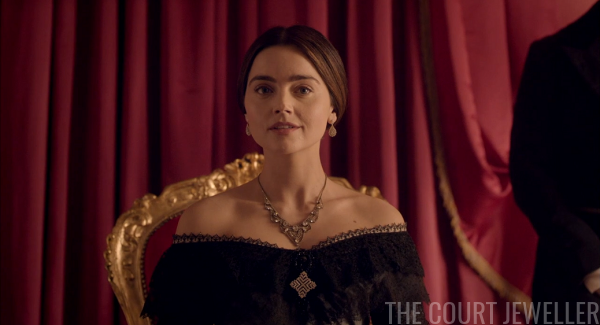 She wears a matching earring and necklace suite, plus hair jewelry, as she returns to her desk. 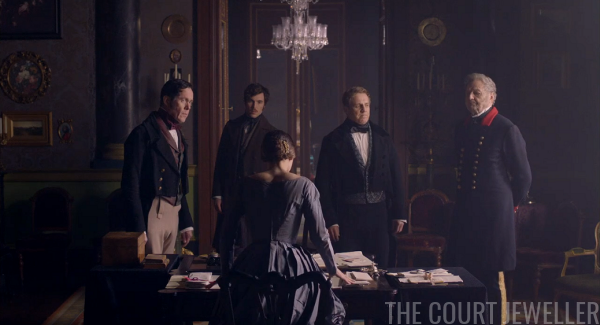 When Lord Alfred Paget pops in to inquire about the state of his brother's military commission, she confesses that Albert's been "doing the boxes" -- that is, handling the state papers and decision-making -- while she was in confinement. Albert even offers to keep reading and summarizing all the state papers for her (so that she won't get too tired), but she gives him a firm no. At least Albert gets a fancy new uniform, though. 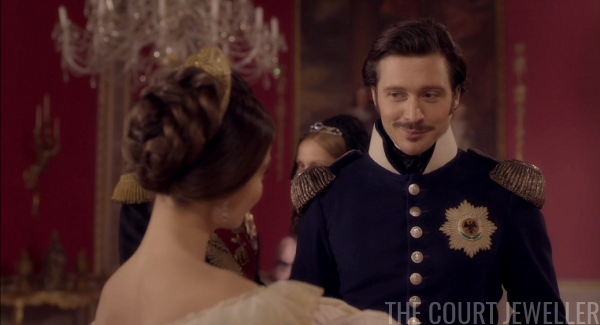 Wearing the production's teeny-tiny version of the Albert Brooch, Victoria expresses her approval, and then decides to help him inspect the 11th Hussars. It's all very colorful and pageant-y. 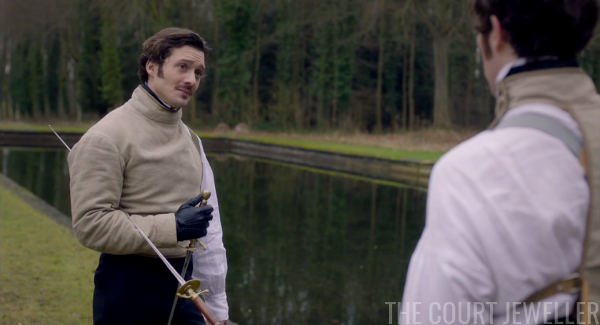 They have a disagreement over military uniforms, though. 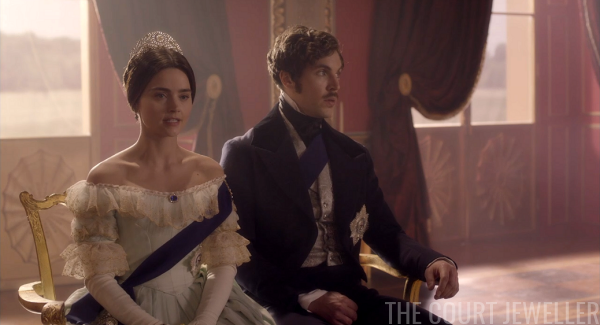 Victoria thinks it's most important that they're "splendid," while Albert just wants them to function efficiently. While all this is going on, Peel has gotten bad news from the army in Afghanistan. 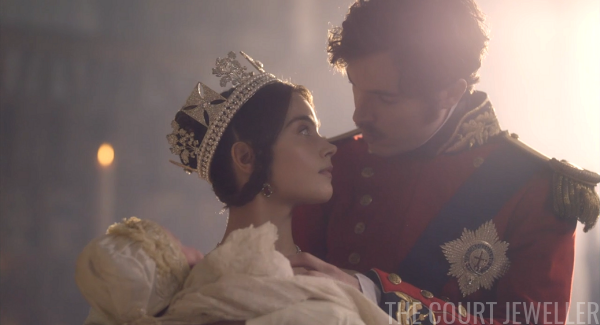 No one has told Victoria, because Albert still doesn't want to stress her out unnecessarily. Wellington thinks this is a terrible idea. 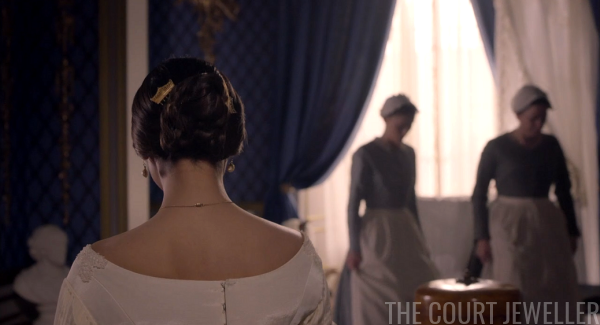 We get a glimpse of Victoria's tiara-esque hair combs as she sneaks in to check on Vicky. 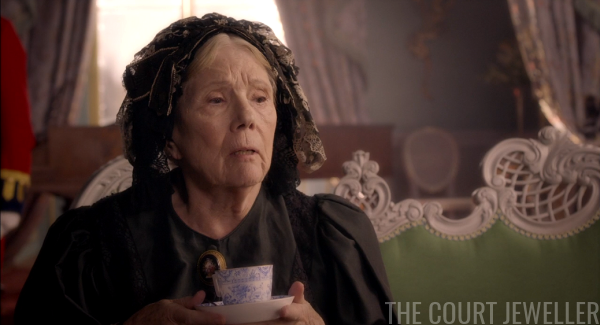 ...the eccentric and dramatic Duchess of Buccleuch, played by Dame Diana Rigg. 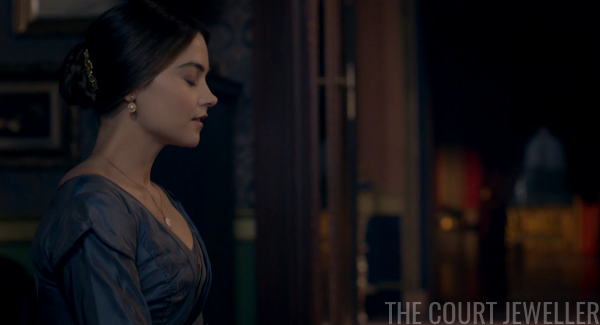 She wears a large brooch pinned to her dress. 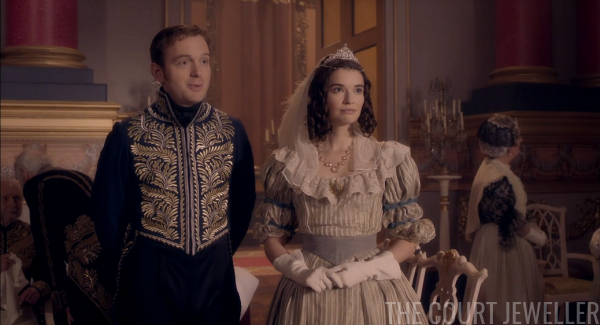 Emma Portman, inexplicably wearing a strange-looking tiara and coordinating necklace in the daytime, offers to show them to their new rooms. Back on red box duty, Victoria burns the midnight oil. 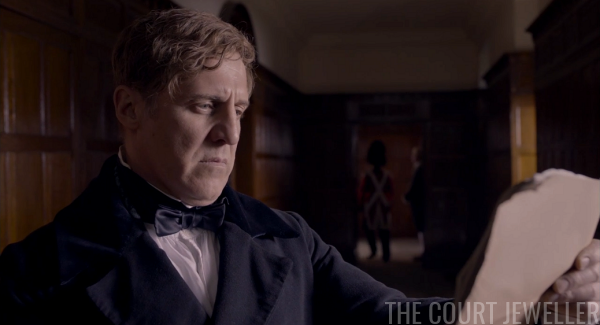 She discovers that Albert has turned down Paget's brother's commission. 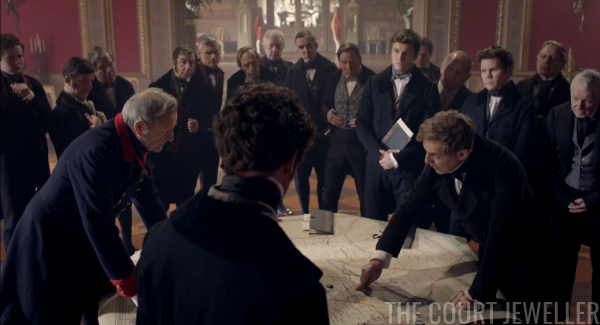 They argue about what makes a good soldier, and then Albert lets it slip that the army is retreating from Kabul. OOPS. He's actually shocked that the Queen of the United Kingdom knows what the Khyber Pass is. Oh, come on, Albert. 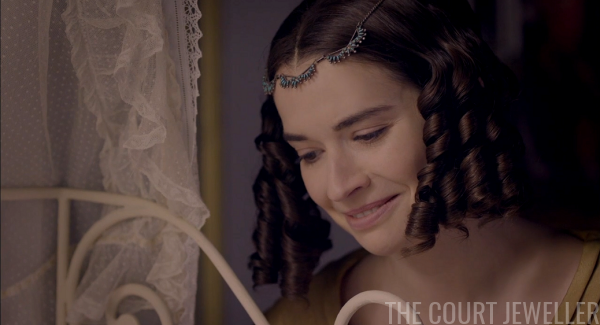 Wilhelmina, wearing a hair comb, pearl drop earrings, and a cameo, enthuses about the book as well. Buzzkill Buccleuch, however, thinks novels are silly. She also doesn't like that a German woman is in charge of Princess Vicky's nursery. 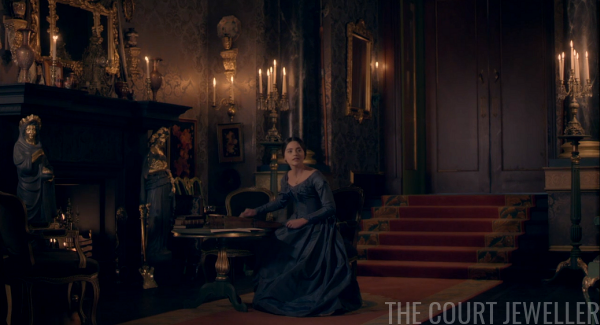 Oh, and she doesn't like the decor or cleanliness level of the palace. Such fun! 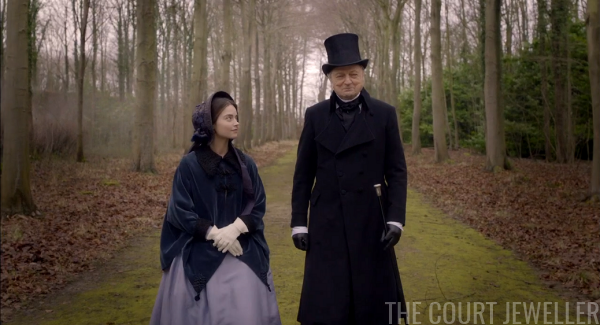 Victoria runs into Peel and Albert, who are deep in conversation about exciting topics like sanitation systems. She lets Peel know that she knows what's up in Afghanistan, and because she's "a soldier's daughter," she's interested in military things. (Also, surely, because she's the monarch?) He promises to keep her updated. 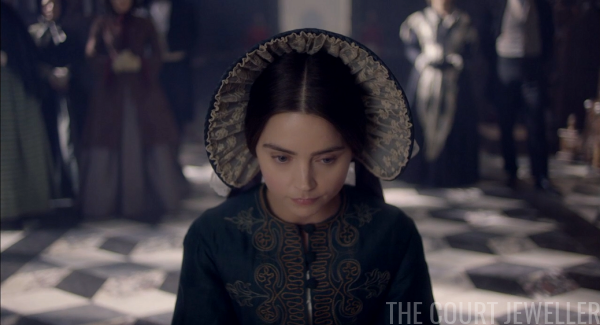 Not trusting Peel or Albert to tell her the truth about what's going on, Victoria summons Wellington, who gives her the gory details about the defeats suffered by the army in Afghanistan. He warns her that she'll need to be ready if the army doesn't make it back from their mission. 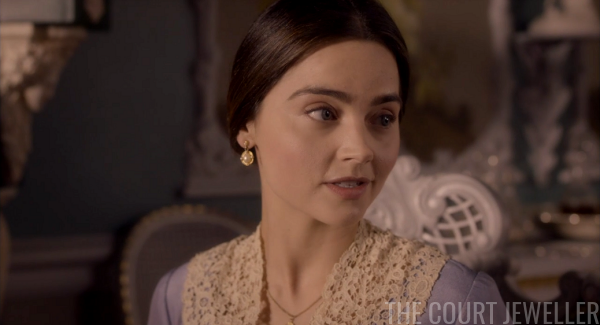 As the Coburgs arrive from Germany for Vicky's christening, Victoria lays in to Albert for failing to tell her the truth about what was happening in Afghanistan. She's wearing a new, production-created tiara with a floral design, plus turquoise drop earrings and the teensy Albert Brooch. 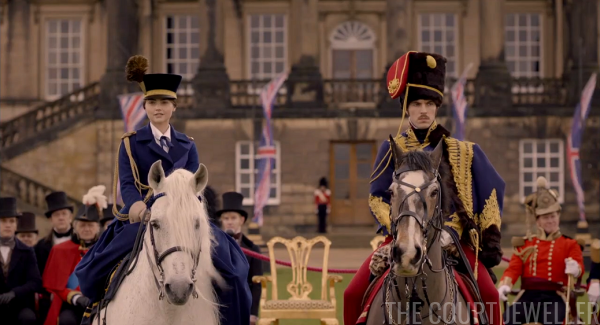 The Garter sashes also look different this season -- they're darker than the normal "kingfisher blue." 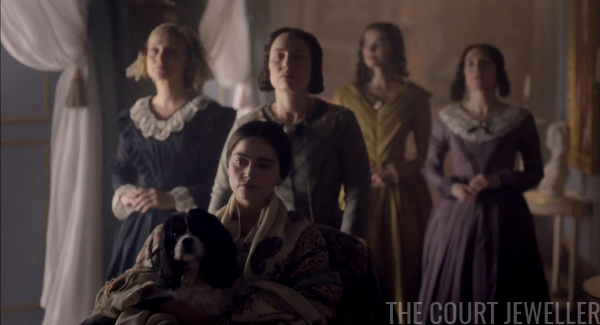 Charlotte Buccleuch, who is wearing an odd tiara set with a cameo, is left holding Dash's leash when the Coburgs storm the reception room. Wilhelmina also gets a pearly hair ornament. 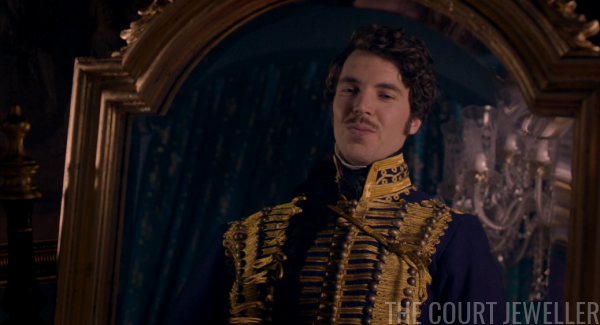 Ernst shows up too, ready to charm the Queen and (I'm assuming) Harriet Sutherland, since she's coming to the christening. 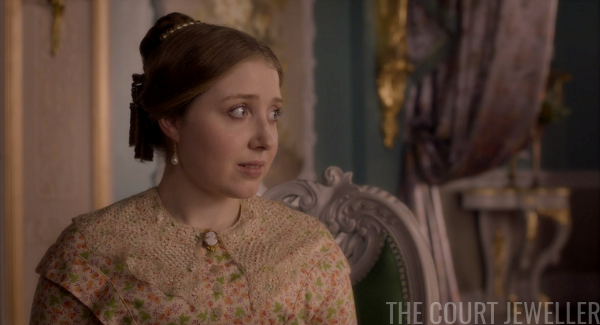 Emma, wearing a monstrosity of a tiara undoubtedly created for a '90s prom queen, informs Ernst that Harriet has left royal service and gone back to her husband. 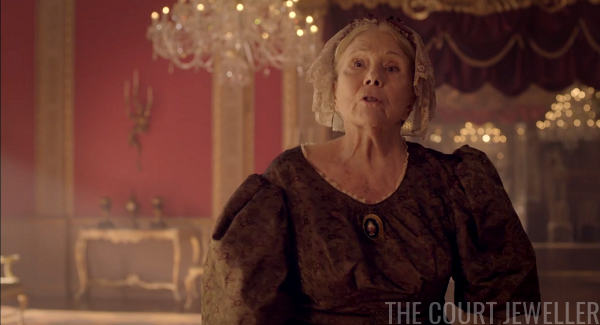 Victoria wants the old chef back. (They eventually get him back.) 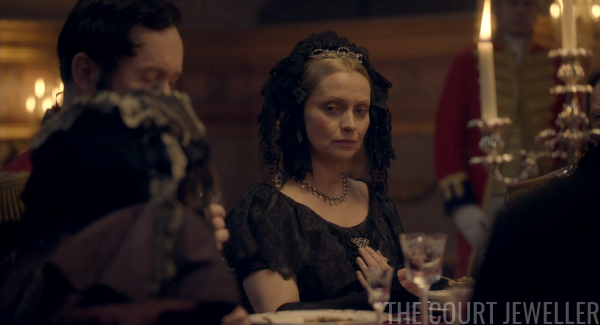 It's one more decision made without her, and after dinner, she and Albert have it out. He says he wants to protect her; she's tired of that kind of paternalistic BS. She's a queen, not a child. Albert goes off to sleep in his own room. 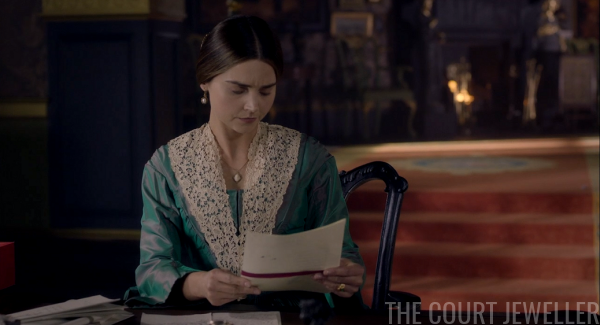 Drummond drops off the army list, and Victoria reiterates that she wants to be the first to know any news from Afghanistan, good or bad. 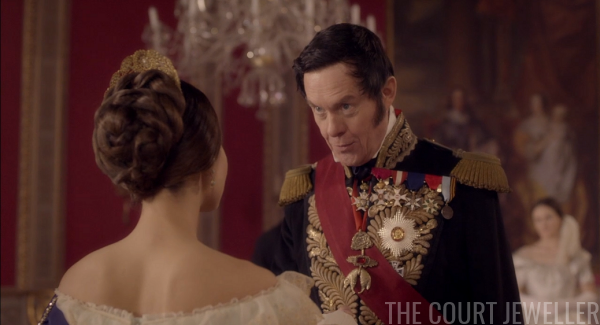 Leopold has already decided that baby Vicky should be married off to the nephew of the King of Prussia. 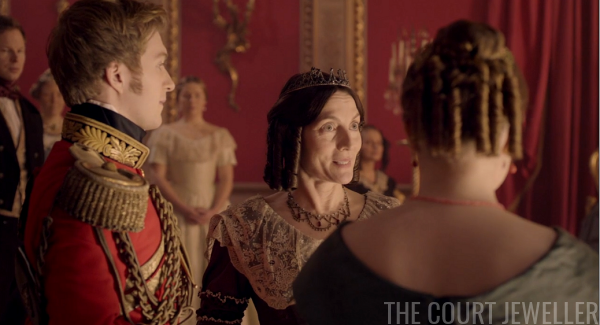 Victoria tells him to hold his horses, and she cuts off the rest of the family's attempts to talk about the many, many more children she should have. 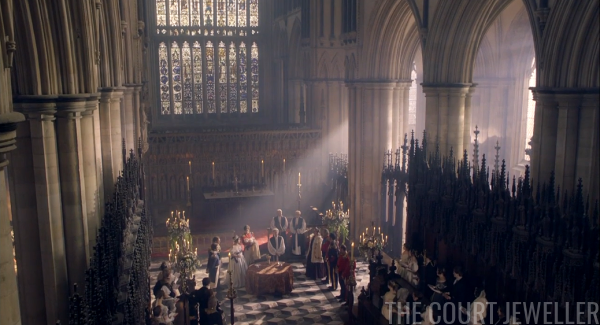 In grand splendor, Princess Victoria Adelaide Mary Louisa is christened in front of her family. 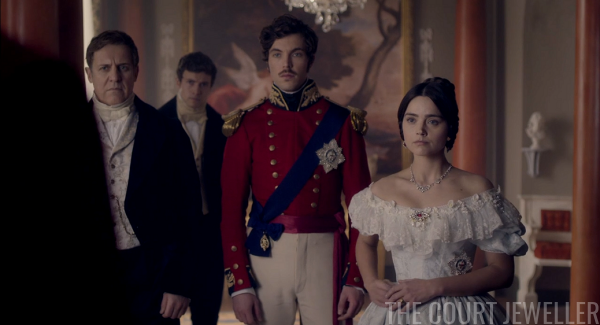 The show sets the christening in one of Britain's grand churches, but the actual ceremony took place in the Throne Room of Buckingham Palace on February 10, 1841. 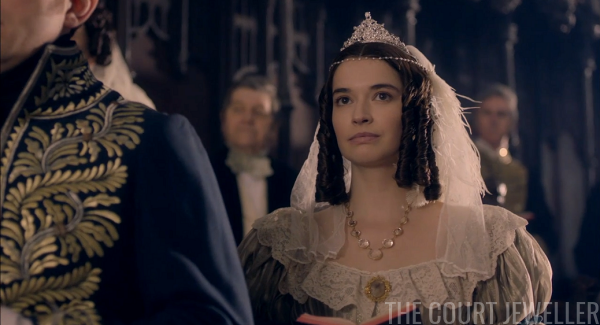 (That date was also Victoria and Albert's first wedding anniversary.) The baby had been made Princess Royal a few weeks earlier, on January 19. 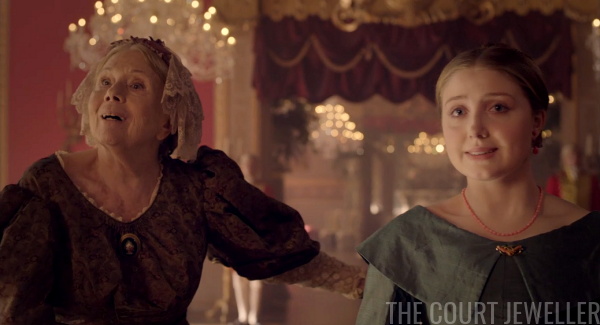 Little Vicky had six sponsors, including the Duchess of Kent and King Leopold. The Duke of Wellington stood as proxy for another godparent, the Duke of Saxe-Coburg and Gotha (who, again, didn't attend). 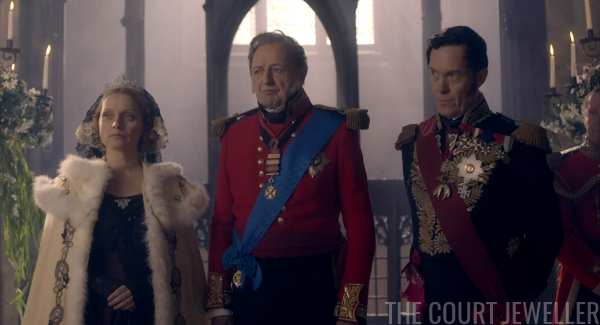 The other godparents: Queen Adelaide, the Duke of Sussex, and the Duchess of Gloucester. 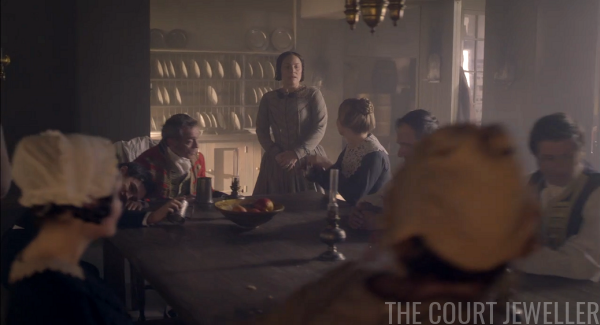 Harriet Sutherland is back, and she introduces her husband to Ernst at the reception following the christening. 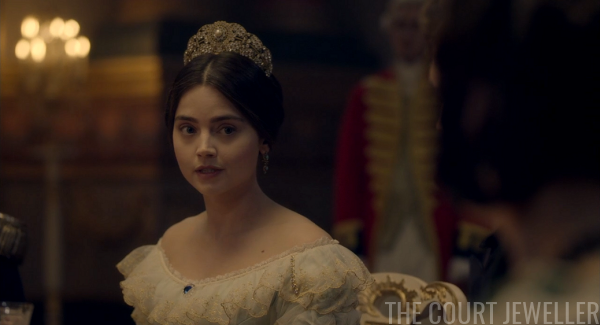 I like that she decided to go with both a tiara and a ferronniere for the occasion. (When you've got a signature piece...) To be fair, the painting of the christening shows lots of ferronnieres in attendance, including some paired with other head ornaments. 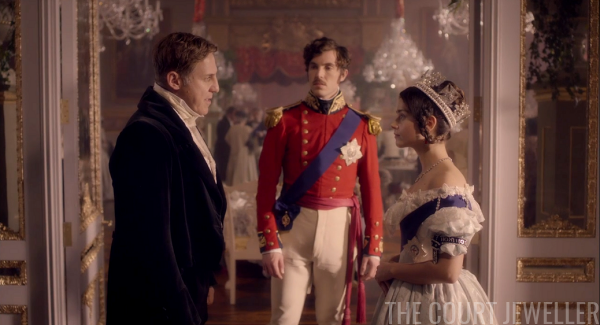 But the party takes a turn when Peel informs Victoria and Albert that the worst has happened in Afghanistan. Out of four thousand troops, only a single man survived. He's just arrived in London. 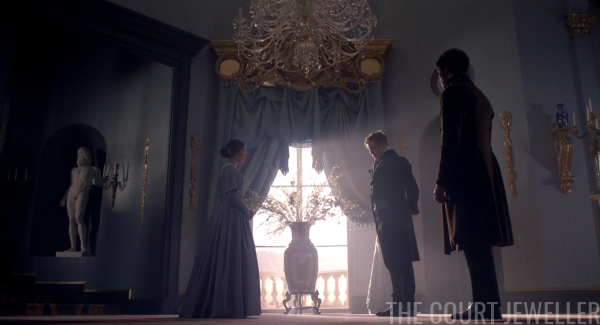 The survivor, Dr. William Brydon, is immediately summoned to the palace, where he meets with Victoria and several others. She does her best to comfort him. Brydon really was one of the few European survivors of the 1842 retreat from Kabul. When the public hears about what happened in Afghanistan, the people are angry. 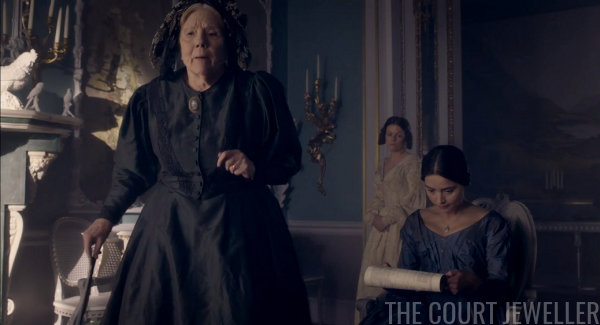 Charlotte Buccleuch declares it "a bad day for the country." Everyone's up in arms. The political parties are blaming each other, and Albert has decided that this is the perfect time to once again promote his ideas for a redesigned military helmet. (Come ON, Albert.) 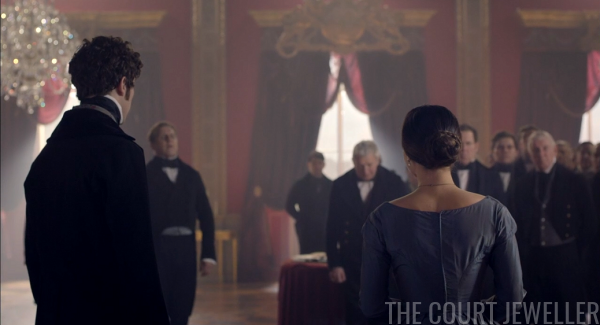 Victoria and Wellington agree that it's time for some pomp and circumstance. 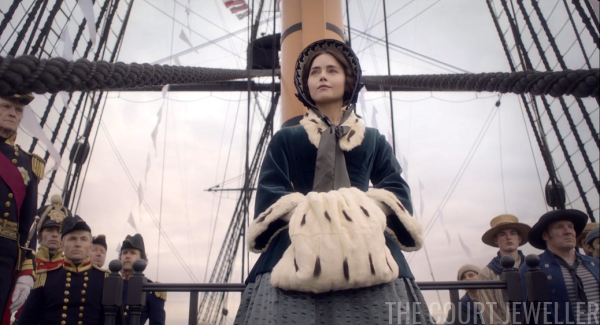 She'll attend the commissioning ceremony for the new HMS Trafalgar. 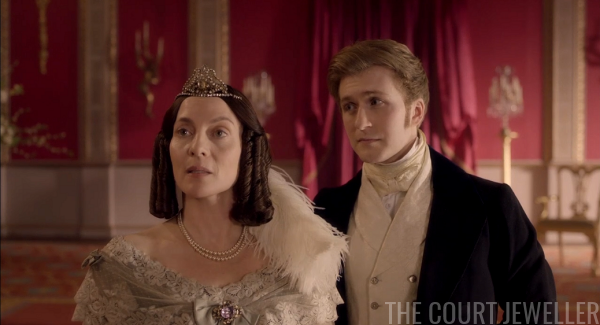 That evening, Victoria receives a letter from Lord Melbourne. (Rufus, come back!) 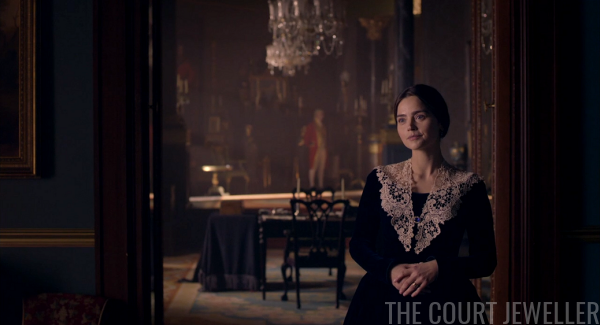 It's a chatty note about his orchid-growing hobby, but Albert assumes that Melbourne is influencing Victoria from afar, and they have yet another argument about control, advice, and Victoria's ability to know her own mind. 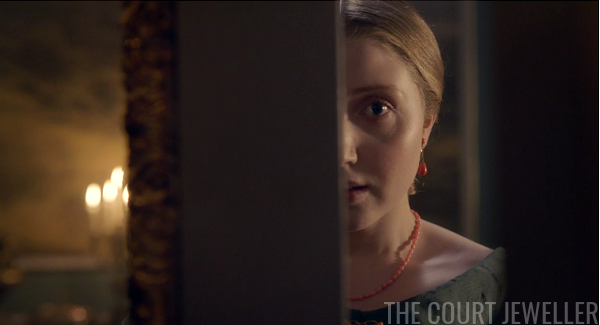 Back at the palace, drama is brewing: young Wilhelmina, in her coral jewels, watches Ernst play the piano. And in the nursery, all is well. 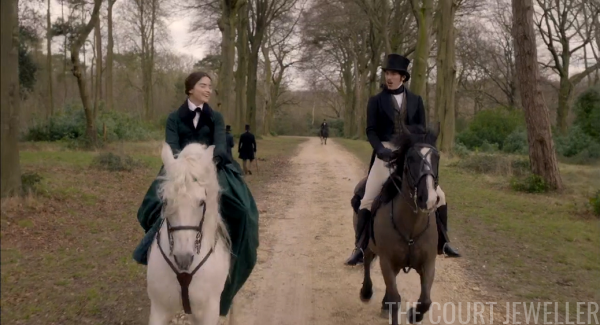 Victoria and Albert are happy once more -- and she even admits that his helmet design wasn't that bad after all. Our recap of episode two (which aired as part of the two-part premiere last Sunday on Masterpiece) will be published here on Friday. In the meantime -- no spoilers for future episodes in the comments!